Here in the Reno Nevada area many homes have small lawns. Small lawns are a way of conserving water and keeping maintenance to a minimum. Natural turf not only to adds a little green in a sea of beige, brown and tan, but gives the home owner a place to throw a ball and play with the pets. Lawns are technically speaking a large colony of plants. Most of us treat this plant colony like carpet … walking all over it even jumping up and down on it! …. don’t try this with your shrubs or flowers! These tiny plants are the most durable little guys out there! Despite all of this abuse your lawn has one arch rival one it doesn’t stand a chance at without a little help…. your dog. Look at it from your lawns perspective…. you walk all over me, stomp on me, cut me down, and now your going to …. well pee on me! … peace out brother… I’m done! All hope is not lost. With just a little tender loving care and consistency your lawn and your dog can co-exist. Here are a few guidelines to keeping a green lawn, and taking care of those little dead spots in the lawn. 1. Keep your turf strong and healthy with a regular fertilization program. The number 1 thing you can do for a great looking lawn is apply fertilizer and weed control at the PROPER TIMES. Timing is everything when it comes to lawns, and if you do the numbers you’ll quickly realize for the price of a decent bag of fertilizer you can have a pro do it for you! Your pro will apply the fertilizer / weed control at 5-6 intervals throughout the growing season and at exactly the right time. 3. Once your lawn is healthy and a solid weed free green, it’s time to tackle those pesky doggy spots. The first item you will want to do is halt weed control. Let your pro know you’ll be seeding and to halt all weed control for 1 month. Weed control often includes pre emergent. Pre emergent does not allow seeds to germinate… even the good grass seed. Once your month is up scarcity the doggy patches with a rake or hand tool loosening the soil… leave some of the dead grass as it’s a good mulch for the seed you’ll throw down. Simply sprinkle some bluegrass seed ( or a seed that matches your lawn grass) in the dog spot areas , then make sure you go one more month with no weed control application ( fertilizer is fine). Patience is key. Grass doesn’t germinate and grow over night so it takes some time . 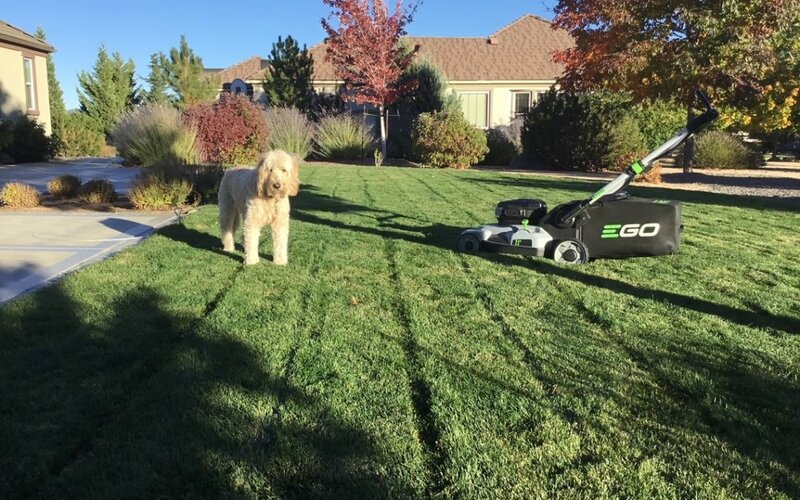 Since your dog won’t stop peeing you won’t stop doing seeding repair, but if you watch your lawn and keep it healthy you’ll only develop a few patches to repair over the course of the season and likely will only need to have 1-2 patch lawn exercises a season. 4. Pick up after your dog. … everyone’s favorite job right? Once a day is ideal never let it go more than 1 week as it will likely kill the lawn in that spot. In cold climates it’s even more important to pick up daily in the winter. For the royalty out there I’ve noticed doggy do pick up services, a quick google search will let you know who’s closest.